As Mobile Device Management product windows Intune can integrate with Sccm 2012 sp1 to manage the mobile devices using the SCCM console. 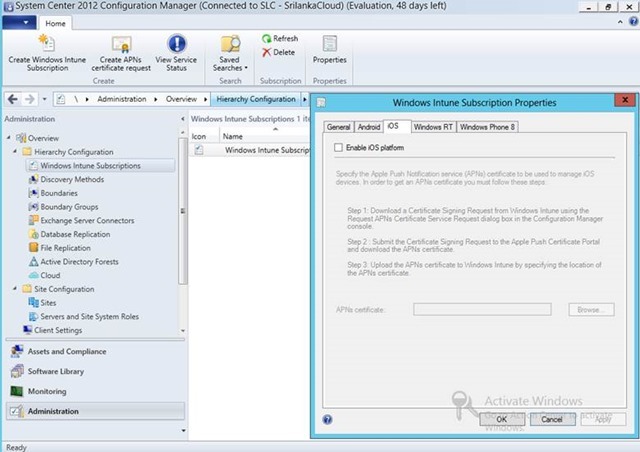 Also Windows Intune can operate via internet without the SCCM integration as well. 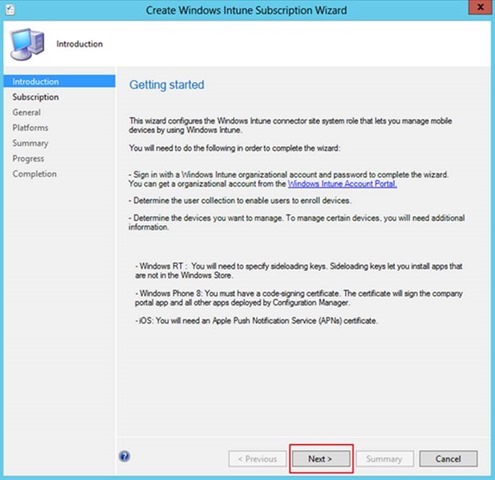 Anyway the below steps give you and Idea how to integrate SCCM 2012 SP1 with Windows Intune. 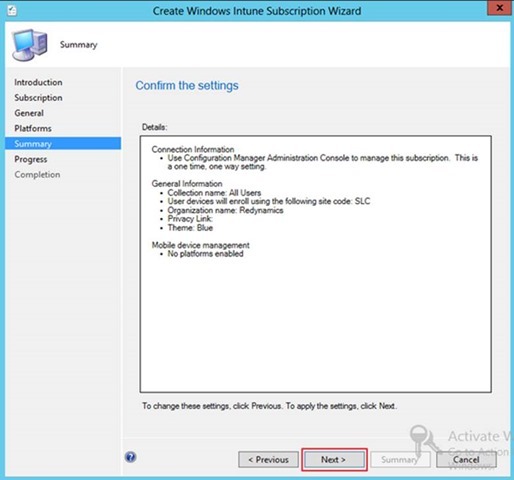 1- Open the SCCM 2012 SP1 Management console and go to Administration> Hierarchy Configuration> Select the Windows Intune Subscription > Right Click on it and Select Create Windows Intune Subscription as indicates in below screen. 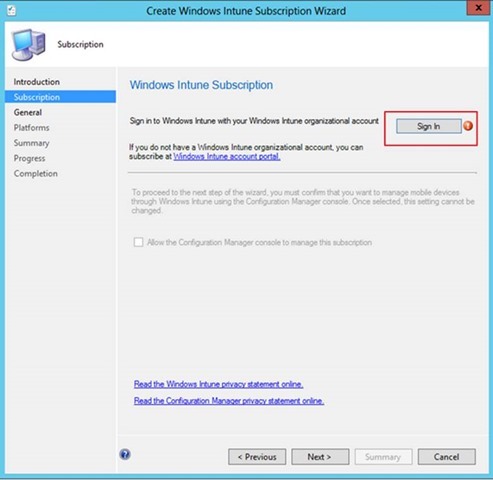 3- On the Windows Intune Subscription Page you have to logging to windows intune account which you already have. Click Singing and key in the account details. 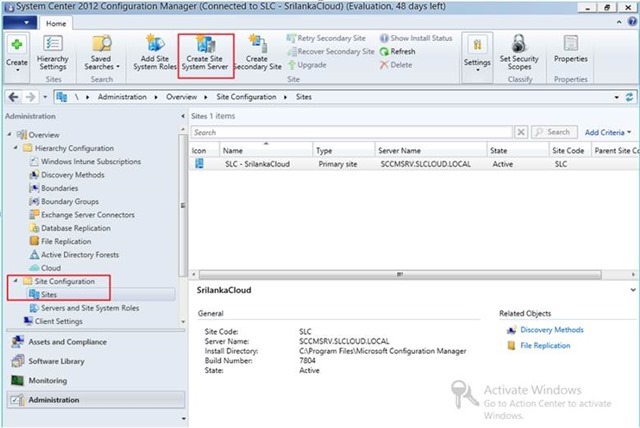 Then SCCM server will connect with your intune portal. Note- Make sure you already have a Windows Intune account created. If not create a free 30 days Trial using your Hotmail, Live or using any of your Microsoft account etc. 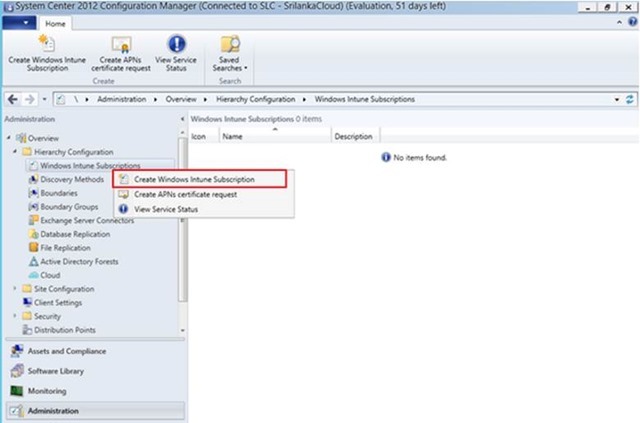 4- Once it successfully connected to windows intune portal and it will enable you to select the option for you to Allow Configuration Manager console to manage the mobile devices. Make a note that once you enable this option you cannot change it back. 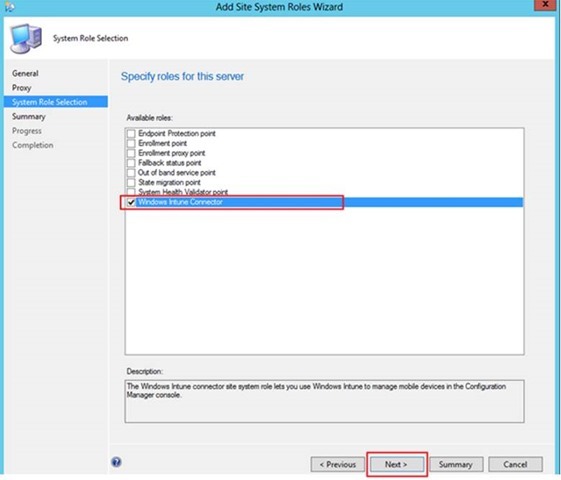 The settings will configured in intune portal and there is no way to change the Mobile Device Management Authority here after. 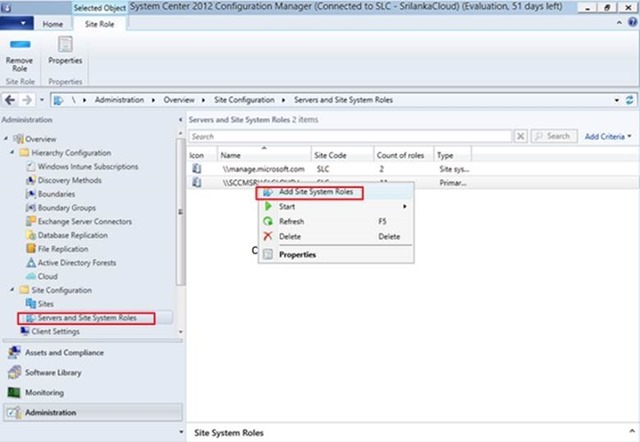 5- Once you enable the Mobile device management using sccm option then Click Next to Continue. 6- On the General Configuration page you can specify the user collection whose members be able to enroll their devices for management. 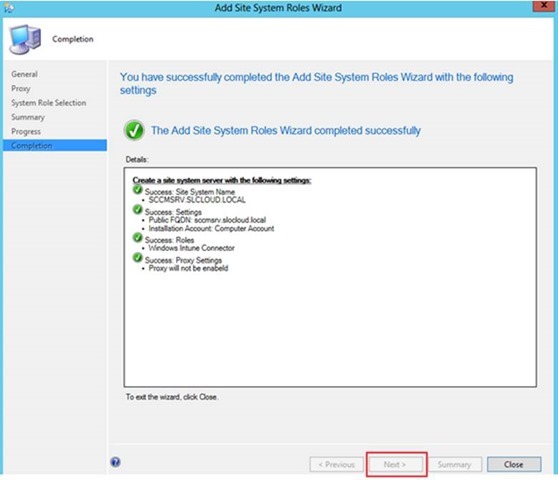 Also the Site code which you use in the SCCM have to select from the drop down list under Configuration Manager Site code. In addition to that you can Type your Company Name and its details as you want. Whatever changes you do will effect for you company portal. When user logged in to the intune company portal to download their applications they will see these details. 7- Click Next on the Summary Page. 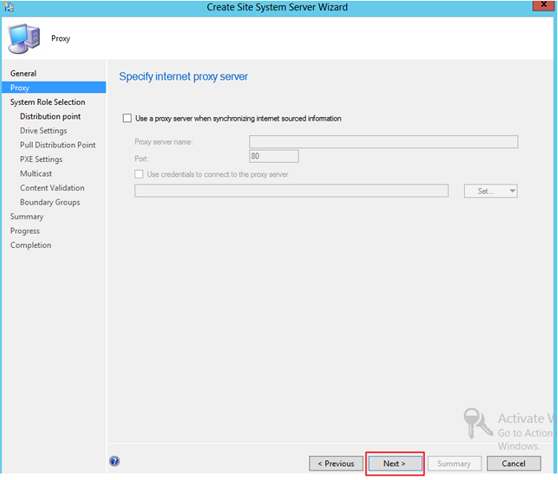 8- Click Close button to complete the integration of Intune. 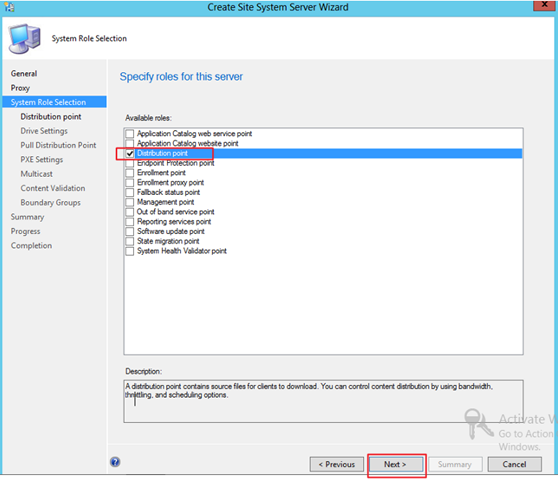 9- After the successful integration of SCCM 2012 SP1 with Windows Intune then you have to add the site system role. 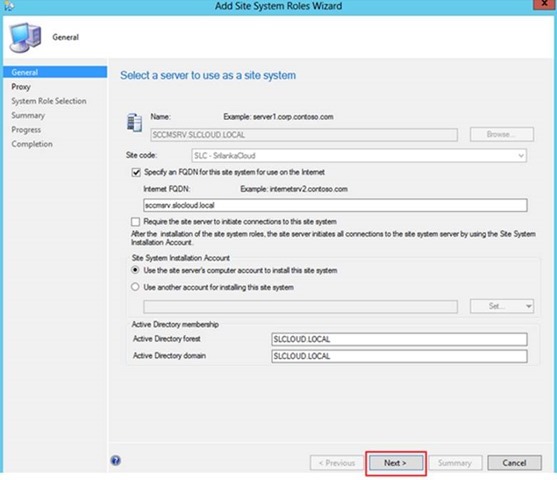 Go to Administration > Site Configuration> Servers and Site System Roles> Select the Management server> Right Click on it> Select Add Site System Roles. 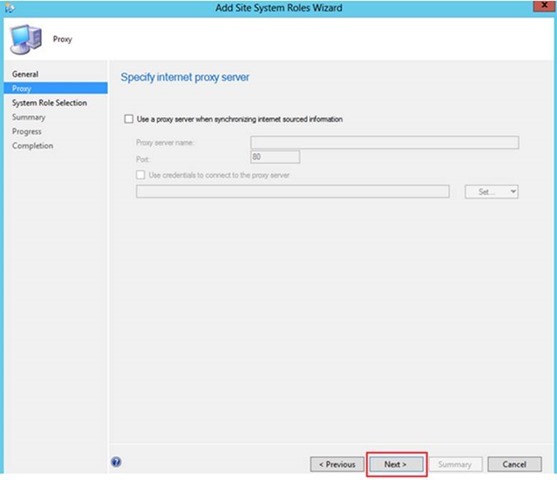 11- If you have a proxy and if you access the internet through Proxy server then key in the details under Specify Internet Proxy Server settings page. If no proxy in your environment just click next to continue. 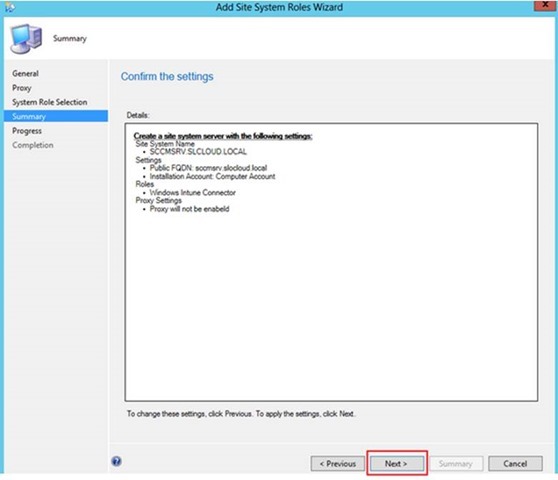 12- On the role selection page Select Windows Intune Connector and Click Next to continue. 13- On the summary page verify the settings you have made for this configuration and Click Next to Continue. 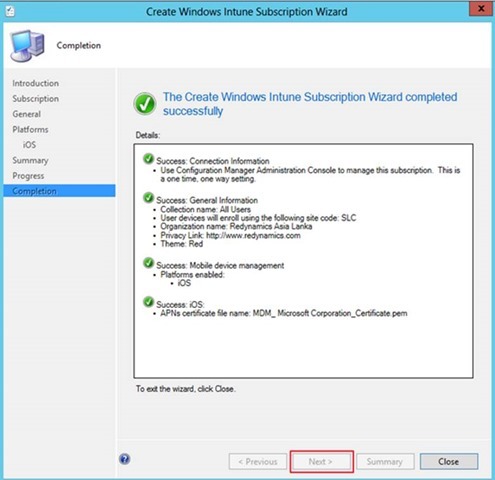 14- Click Close button to complete the Intune Connector role adding process as follows and make sure it’s successfully added. 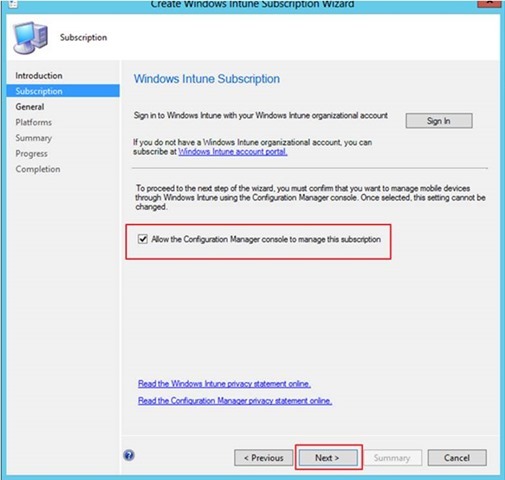 15- After the integration you have to add the Distribution point for windows intune users. In this case you have to add manage.microsoft.com as your DP. In this setup you don’t need to add IIS, PXE or any just skip all those and add the DP (Manage.Microsoft.com) only as follows. 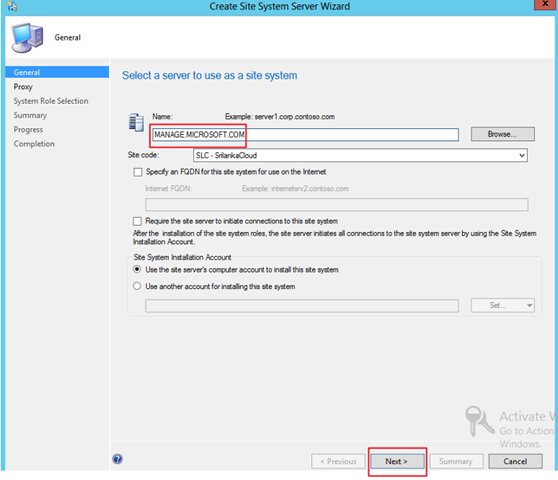 16- Type the MANAGE.MICROSOFT.COM as you site server under Name column of the server and select the Site Code and Click Next. 17- Click Next on the Proxy settings. If you access internet via proxy then key in the settings for it. 18- On the System Role Selection Page Select the Distribution Point as follows and Click Next to continue the installation. 19- As I mentioned to you earlier you don’t need to worry about adding IIS, PXE or any setting in next steps. Just skip all and continue clicking Next button until you meet the completion of adding DP. Even if you select IIS no harm at all. The reason is we are using MANAGE.MICROSOFT.COM as the DP for Mobile Device Management. 20- After the completion of the above steps now you can manage your iso, WP8, Android and Windows RT devices via SCCM console. To configure the Mobile settings you can Right Click on Windows Intune Subscription and > Properties> Enable the Mobile devices you want to manage. In the following example gives you an idea of it. In my next article I will show you how to add the Apple Device to Intune and the way you can manage it. This entry was posted in System Center 2012. Bookmark the permalink. Thanks for this post. Can I still use SCCM and Intune in any capacity if I chose to use Intune as the Mobile Device Authority? What will happen if I attempt to connect SCCM having done that?